A few days had passed since our Thanksgiving feast. My husband came into the kitchen to tell me it was time. We gathered next to George’s bedside, Jon and his siblings surrounding their father. My son, Clayton, was sitting on my lap quietly observing the sudden swirl of activity and tears. As George was given a departing blessing, sending him peacefully to the other side, his pulse weakened and finally stopped. Amid the sounds of sobs and sniffles, a light and happy sound broke through- Clayton was laughing. A welcomed, surprising sound brought tearful smiles to an unlikely moment. 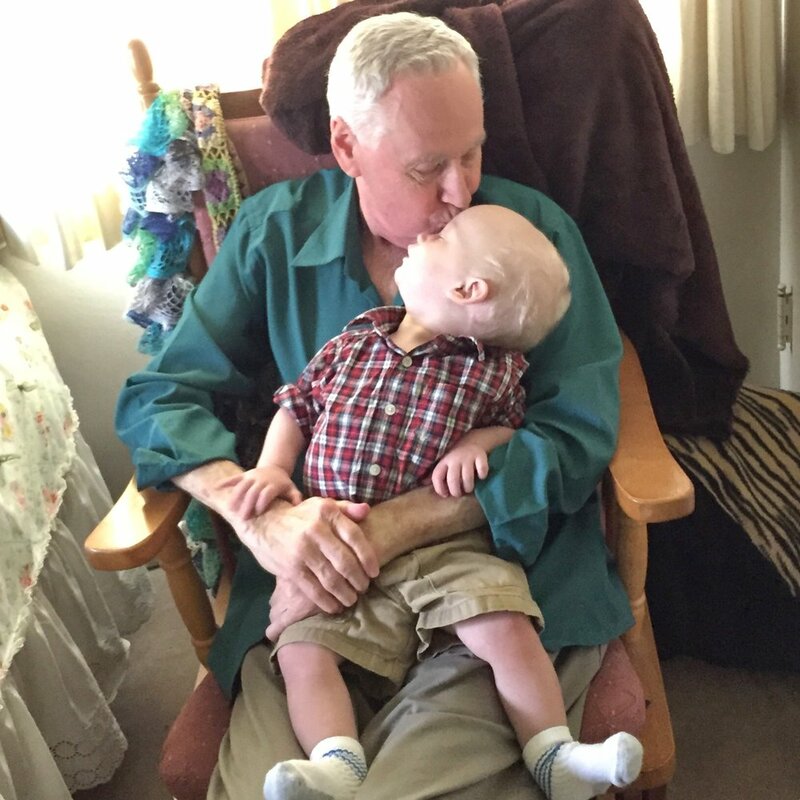 One of Jon’s brothers looked to the baby and asked, “Did grandpa tickle you on the way out?” adding welcomed levity to the otherwise heartbreaking situation. In the moments that followed, I thought back to my last few encounters with George. His son’s wedding a month before, and his elation at finally seeing his last single son marry a wonderful woman. During that same week, he and I sat alone in the kitchen as I told him about a compliment someone at church had paid him, wanting us to pass it along. He humbly nodded as I recounted the story, expressed gratitude, and then expanded on his love for his religion and his Savior. He had endured to the very end, and his future was as bright as his faith. 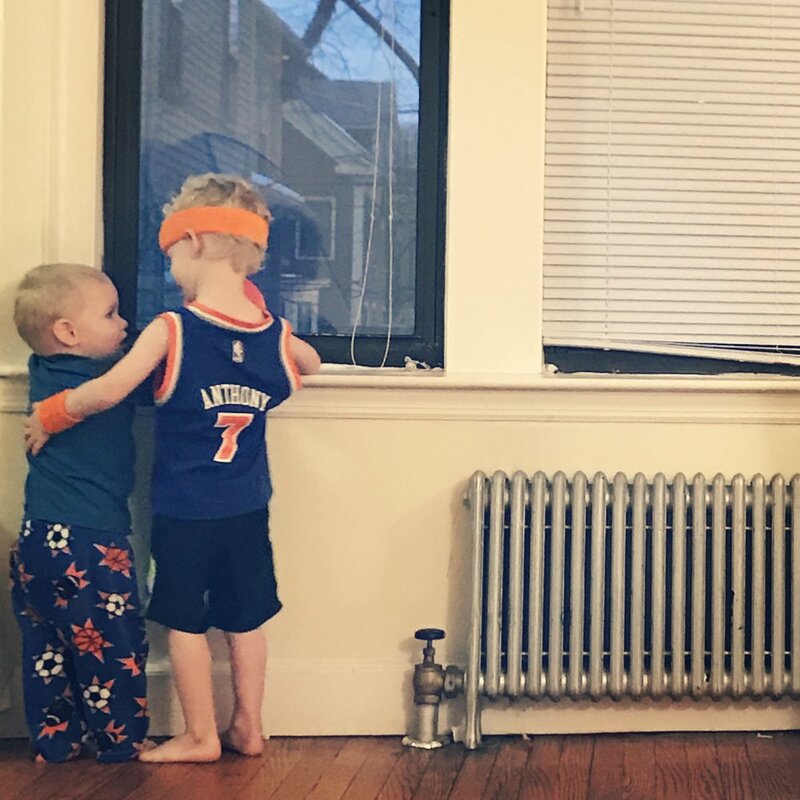 My mind wandered back to almost a year earlier, the many days of me, in my post-baby-delivery state, living in his home, being a mess of emotions and fluctuating moods. Him, every single day and every single run-in, greeting me with a smile, asking how I was doing with every bit as much sincerity as he had the last time I saw him not an hour earlier. Although I almost always turned down his offers to help or make me dinner, he never stopped asking. It would have been much easier for someone with severe arthritis and a failing heart to shout rather than make the trek down the stairs to ask, he never did. He always came to me like a tried-and-true gentleman. I thought of last year’s Christmas season, where he had offered to organize the local care center’s Secret Santa tree- which included cutting out paper stars and writing the desired gifts on them. When many stars were left without Santas, he purchased the gifts and brought them home to wrap. He knew each person by name and trudged through the Christmas rush to numerous stores to get the perfect items for each person. I offered to help him cut out the ornaments and wrap the gifts, as his hands weren’t exactly nimble after years of arthritis. My heart was so touched seeing that he was actually planning to cut out each one, and was genuinely surprised and supremely grateful that I would be willing to help. He had been prepared to take care of the these all-but-forgotten people's Christmas wishes, even knowing it would take him all day on his own. A few months after that Christmas, he would go into the hospital to find that he needed a 6X bypass on his heart due to many blockages and failed stints. Upon discovering this, I looked back on the time leading up to it and realized what pain he must have been enduring. It made his small acts of kindness that much more humbling to remember. To me, the light I felt surrounding George is the same one I feel surrounding my baby boy. It's purity of heart and soul. It softens me, disarms me, sometimes against my will. That’s why I felt it especially fitting when Clayton responded with lightness and smiles during a time when darkness and gloom could have prevailed. Even in his death, there was light. It was as if George’s feelings of being relieved of the pains that his mortal body had given him for decades were communicated through the mouth of a babe. All is well, I am free. Dozens of times a day, Clayton will come toddling into the room, make eye contact with his dad or me, and smile and laugh as if he hadn’t seen us in weeks. It might have been 10 seconds. George’s greetings, to a tired new mom who often couldn’t bring herself to respond in kind, were just as warm. In many tributes given of George following his death, it has been often said that he made people feel as if he had waited his whole life to meet them. Just like a child, so free with love. Perhaps the example of George that I treasure the most, is his extraordinary love of being a father. I benefit every day from being married to a man who saw first-hand how raising children brings the greatest of life’s joys. That joy was written across George’s face every time he sat quietly and watched his seven fully grown, yet rowdy as ever, children laugh with and enjoy each other. I hope to never forget his soft chuckles as he fell miles behind in a board game, having no concern whatsoever for winning. He was just happy to be there to play, and usually, to watch one of his kids win. Several of his children spoke of times growing up where they would walk by their dad’s office and notice him kneeling or speaking, and they would eavesdrop as he poured out his heart to God on their behalf. How could a child not feel loved by their father, knowing his deepest desire from God was their welfare? I think often of a beautiful sentiment expressed in the eulogy given at George’s funeral by one of his sons. He quoted a line from the movie, Oz, the Great and Powerful. He went on to say that George was not a great man. He was better than that, he was good. There is much ado surrounding the flashy, prominent, status-laden men of society. Many of them are considered great, but few of them are good. Another one of George’s sons sat with him months prior to his death, both of them knowing the end was approaching. The son explained how even in the midst of this knowledge, George changed little in his life. I’ve thought of this a lot these past few weeks, wondering what it would take to get me to that point. How many, if they knew they had only months to live, would feel totally at peace continuing to live life the exact same way, day-to-day? Only the pure in heart, only the good. As I watch my son grow, I can’t help but feel goodness grow in me. His purity carries with it the goodness I saw and felt from George, as only a child could do. I see the goodness in my husband as he strives to carry on this legacy, to promote goodness in the world, beginning with working hard at loving his wife and son. While in the hospital after open heart surgery, George was heavily sedated but a little coherent. After visiting one day, Jon said “I love you” and went to leave. George responded, “I love you. Who is it?” Of course, he didn’t need to know who said it before responding with love. Good fathers are a rare and diminishing breed. The more I see of this world, the more I am filled with gratitude for having been given one of my own, one who taught me to marry a man who knows what a real father looks like. If kindness is the essence of greatness, then one can only be truly great if one is also good. Until we meet again, rest in peace Grandpa George.